St. Marcarius the Great was truly a saint chosen by God from a very young age, perhaps even from his birth. He was born in the village of Shabsheer-Menuf, in the province of Giza south of Cairo, from good and righteous parents. His story is reflective of another found in the Holy Bible. His parents were Abraham and Sarah and they had no son. In a dream an angel of God told Abraham that he would have a son and his name would be known all over the earth. This son would be further blessed with a multitude of spiritual sons. When Abraham's son was born, he was named "Marcarius" which means blessed. He was an obedient son in all things. At his parent's insistence and against his will he was forced into marriage. Feigning an illness, he asked to be allowed to go into the wilderness to seek a speedy recovery. While in the wilderness Marcarius prayed to the Lord Jesus Christ to be directed to do what was pleasing unto Him. His humbleness gave him the strength to be obedient in all things despite his personal desires. While in the desert Marcarius had a vision in which he saw a beautiful winged Cherubim who took him to a high mountaintop. While at the height of the mountain, Marcarius was told, "God has given the desert to you and your spiritual sons for an inheritance." He was shown the vast expanse of the desert to the east and west, north and south. Following this he returned from the wilderness home to find that his virgin wife had departed. Although respective of the departure, Marcarius was now happy to lead the life in which he so ardently desired. Shortly thereafter, his parents also departed and he gave all that they had left to the poor. At about the age of 30, he began his life of asceticism in a cell near his village. The people of the village admired his humbleness and purity and took him to the Bishop of Ashmoun who ordained Marcarius as a priest for them. Father Marcarius had not wished to become a priest. In his humility he could not refuse. A certain young girl in the village became pregnant and accused Father Macarius of fathering her unborn child. The people without weighing the matter immediately sought him out and brought him back to the village. They beat and whipped Father Marcarius severely and hung huge black pots around his neck. He was forced to go before the village while they were mocking him and saying, "This monk seduced our daughter. Let him be hanged." With the merciless behavior shown to him he continued in humility. When allowed to return to his cell, he gave a young man all the mats that he had made from the work of his hands. Father Marcarius instructed the young man to "Sell these mats and give the money to MY WIFE that she may eat." Father Macarius in thought had accepted this young woman as his wife without a single denial or bitter thought. He worked night and day making mats to send money to her. Humbleness was the mother of forgiveness in this saints soul. At the time of the young girl's delivery, she suffered many days in labor. The unbearable pain motivated the girl into telling the truth regarding Father Macarius. She related to all that she had falsely accused this priest and that he had never so much as touched her. Having not been able to deliver until she confessed, the entire village was remorseful at their judgmental actions. When Father Macarius heard that the village was on route to seek his forgiveness he fled to the place where he would live the remainder of his holy life. His humble and forgiving natures were the clothes in which he would wear throughout his life. This is how he came to the Desert of Scetis in the Valley of Nitron. He is known to have visited St. Anthony to seek his spiritual guidance in beginning his life in the desert. The prophecy foretold to him by his lifetime companion the cherub was about to be fulfilled. Many monks joined Father Marcarius in the desert, filling the wilderness with prayers and fasting. Countless cells and caves were filled with these men who desired to be in continual worship to the Lord Jesus Christ. It is said that he dwelt in the Inner Desert, in the place of the Monastery of Sts Maximus and Domadius, which is now known as the Monastery of El-Baramous. As the monasteries rose in number this dry desert begin to flower and became known as "The Paradise of the Holy Fathers". One day while meditating St. Macarius thought that perhaps there were no more righteous people in the world. A voice came from Heaven and said "In the City of Alexandria you will find two very righteous women." He took his staff and went to the city. He was guided to the home of the two women where he inquired of their life. One of them related to him, "There is no kinship between us and when we married these two brothers we asked them to leave us to be nuns but they refused. So we committed ourselves to spend our life fasting until evening and we pray diligently. When each of us had a son, whenever one of them would cry, any one of us would carry and nurse him even if he was not her own son. We are in one living arrangement, the unity of opinion is our model, and our husbands work as shepherds, we are poor and only have our daily bread and what is left over we give to the poor and needy." Rejoicing he bade them farewell. Reflecting upon the comfort of the Holy Spirit to all those who loved the Lord his soul was filled with compassion once again and he returned to his beloved desert. Father Marcarius is known for his humble encounters with those whom followed him into the desert way of life. There was a certain monk who was leading other monks astray in his proclaiming that there was no resurrection of the dead. The bishop of the City of Osseem went to Father Marcarius and told him about the saying of this particular monk. Father Marcarius went and stayed with the erring monk until the monk returned to the correct and true beliefs concerning the resurrection of the dead. As the abbot of his monastery, Abba Marcarius dealt with many problems and always solved them in a humbled manner. It was reported to him through the monks of the monastery that a particular monk had allowed a woman to enter his cell. Abba Macarius did not reprimand nor scold this monk. The monks continued to wait for the woman's return. Upon discovering her presence once again they reported their finding to Abba Macarius. He entered the monk's cell and asked the others to wait outside. Upon hearing the approaching footsteps of others, the brother had hidden the women in a big trunk used for storing grain. When Abba Macarius entered he promptly sat upon the trunk knowing its hidden contents. He called the other monks to enter. They did not see the women in question and dared not to ask Abba Macarius the contents of the trunk he was sitting upon. When the others had left, Abba Macarius looked at the brother in question and said, "Brother, judge yourself before they judge you, because the true judgment comes only from God." As did our Lord and Savior, Abba Macarius concealed other people's sins. As was the birth of this humble saint so is his departure date. The twenty-seventh day of the Blessed Month of Baramhat is also the Commemoration of the Crucifixion of the Lord Jesus Christ. I am sure this humble saint considers it with solemn humility to have his departure date overshadowed by the Commemoration of the Crucifixion. With the Holy Crucifixion foremost in everyone's mind, the Lord our God allowed Abba Macarius the Great's life to remain "clothed in humility" for all generations and all the years to come. 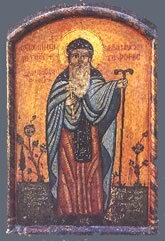 May we keep the humbleness of Abba Macarius and his total dependence upon God ever before us and may this great saint's blessings be with us all.